After a bit of creative tinkering I've come up with yet another pattern. This time it is a combination of two of my favourite hobbies, crocheting and jewelry making. But a little about my latest pattern. I've been going through a bit of a creative period lately, and coming up with all sorts of different ideas for things. 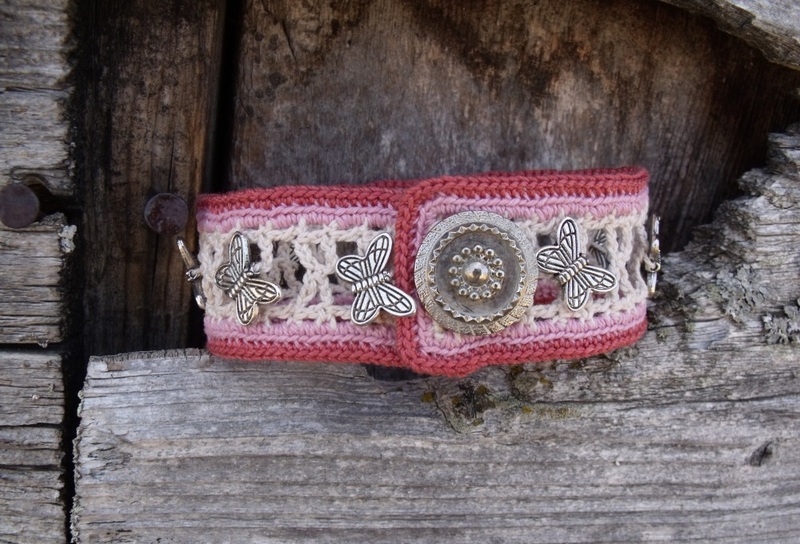 This one was inspired by a crochet trim pattern I found in an old pattern book. 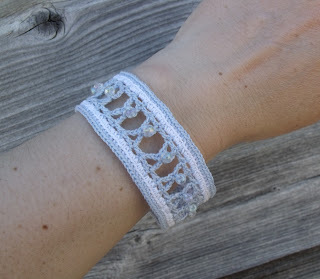 It didn't have any beads or an edging of any sort but developed into a new bracelet. The first couple bracelets I made were all one colour and pretty blah. They had potential but needed a little extra to add a bit of proverbial spice. I played around a bit and added some beads to the ladders. Not bad I thought, but still not quite enough. 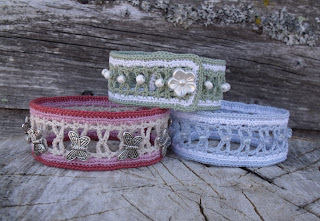 So as I was finishing off one bracelet and I thought it would be a good idea to incorporate the edging of my other crocheted bracelets. Now I was cooking with gas as my grandfather used to say! And then I was searching through my stash of beads and found the butterfly charms I had ordered from eBay years ago. That led to what I really think is the best version of this bracelet yet. I've added the pattern to my website as instant downloads. 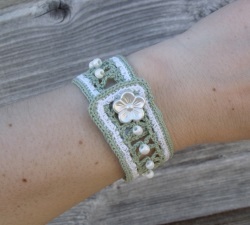 I've called it Beads and Ladders Crochet Bracelet. I know some people find individual websites sketchy so I also have it for sale in my Etsy shop as an instant download and as an email I can send to you. It's also available at Amazon and should be hitting the digital bookshelves in all the other retailers like Barnes & Noble, iBookstore, etc. very soon. My distributor is in the process of submitting to these retailers. The coupon code will only work on my website. The others either don't allow for discounts or are too general to be applied only to my patterns. Sorry but it's the best I can do. 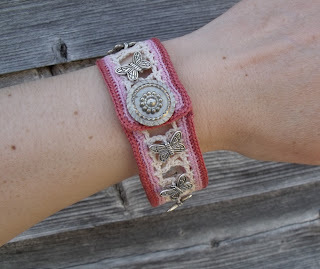 Love the bracelet? I have the exact butterfly bracelet for sale in my Etsy shop right now! It's one of a kind so you'd better act fast before it's gone.